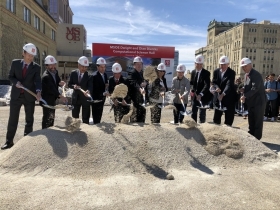 Mortenson’s Scott Heberlein, County Executive Chris Abele, MSOE Board of Regents chair Dan Moceri, Governor Scott Walker, MSOE President John Walz, Dwight Diercks, Dian Diercks, incoming freshman Alex Ruchti, architect Scott Ramlow, Mayor Tom Barrett and MSOE VP of Academics Eric Baumgartner. Photo by Jeramey Jannene. 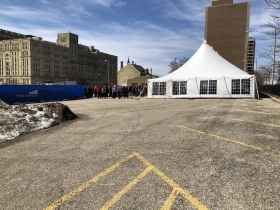 The Milwaukee School of Engineering held a ceremonial groundbreaking Monday afternoon for a new educational center. 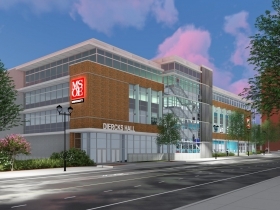 The $34 million Dwight and Dian Diercks Computational Science Hall will be built on the northwest corner of N. Milwaukee St. and E. State St. 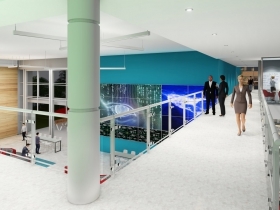 When finished, the building will have 64,000 square feet of space spread over four floors. The facility will house classrooms, faculty offices and a 256-seat auditorium. As part of the development, the university will add a computer science program centered around artificial intelligence to augment their existing software and computer engineering degree programs. Diercks joined Nvidia 24 years ago as its 22nd employee. Today the company employs over 11,000 people (with Diercks supervising thousands of them in his role as vice president of software engineering) and has a market cap of $135.6 billion. It is headquartered in Santa Clara, California. The company initiated a major focus on artificial intelligence in 2012. 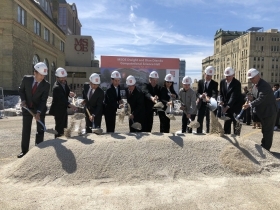 According to MSOE President Dr. John Walz, “the building will contain a number of state-of-the-art Nvidia computers.” The facility, which will house the new degree program, will be utilized by students from all degree programs. Architect Scott Ramlow noted “the building is strategically placed to be somewhere students cross daily.” It will sit at 1025 N. Milwaukee St., near dead center in MSOE’s campus. Diercks and Walz were joined at the groundbreaking by Gov. Scott Walker, County Executive Chris Abele and Mayor Tom Barrett. Also delivering brief remarks were Board of Regents chair Dan Moceri and Vice President of Academics Eric Baumgartner. Walker praised MSOE for training the next-generation of the Wisconsin workforce leaders, while Barrett praised the school for being a leader in Downtown’s revival. Abele tied the two together, noting “this would be an extraordinary announcement if it was merely a $34 million gift, but it’s more than that.” He praised the university for being the first to develop artificial intelligence research capabilities in the state, and for doing it in Milwaukee. 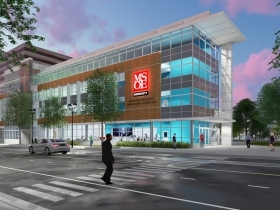 MSOE unveiled plans for the building in October 2017. Progress since then has proceeded ahead of Walz’s estimate of a late summer groundbreaking, drawing praise from Diercks. “They’re making it look easy,” the tech executive stated. 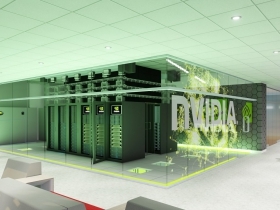 One key factor has helped make this project possible: the rapid rise of NVIDIA stock. When Walz became MSOE President on July 1st, 2016, the stock was trading at $46.66 per share. When the gift was announced the stock was trading at $198.35 per share. It opened trading this morning at $228.71 per share. Since the project’s announcement, NVIDIA’s value has climbed by $17 billion. NVIDIA’s technology, both hardware and software, is used in everything from computer gaming and graphics processing to self-driving vehicle and cryptocurrency computation. 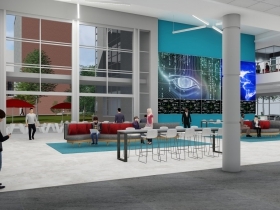 The new facility will include a computing cluster laden with graphics processing units that will enable large-scale applications and computations to be executed by MSOE students, staff and industry partners. A handful of MSOE faculty members were recently at NVIDIA’s annual conference to further their education in the company’s “deep learning” framework and become certified instructors. When the silver shovels were busted out to get the construction started, Walz had one surprise guest. The dignitaries were joined by the first student to put down an enrollment deposit in the university’s upcoming computer science program, incoming freshman Alex Ruchti of Pewaukee. Mortenson will lead general contracting on the 16-month long construction project. Observers will note that the proposed building’s facade borrows elements from two other recent MSOE buildings, the Kern Center and the Viets Field Parking Garage. The buildings were all designed by long-time MSOE architectural partner Uihlein/Wilson – Ramlow/Stein Architects. The site hasn’t always been a parking lot. It was the long-time home of the Welsh Presbyterian Church. It was built in 1854, and demolished by the university in 1988. More recently, MSOE demolished the “C Building” on the south end of the site in 2005. The C Building was originally built by the nearby German English Academy and was acquired by the university in 1948 and used as an administrative building by MSOE. The new building underwritten by Diercks will back up to the Grohmann Museum and former German English Academy, which houses classrooms, an art collection and a rooftop gathering space for the school. 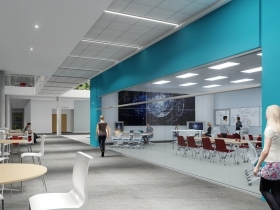 The German English Academy is currently undergoing a $9 million renovation funded by Direct Supply, which is leasing space in the facility to better connect with the university. Why did Scott Walker attend? The education of people, especially for high-tech jobs, should be of no concern to him. An exciting, decisive step in the right direction. The result of cultivated relationship with a grateful alum.. Milwaukee should be grateful. So what happened to the “powerhouse” UW “Engineering Campus” that was supposed to happen on the County Grounds? Walker, while county exec, sold county land for pennies on the dollar to UW. Then UW flipped the land to private developers and Carlos Santiago, then UWM chancellor, resigned and hightailed it out of the state shortly afterwards.